It was rather early in 2008 when Square-Enix announced their plans to re-release Chrono Trigger for the Nintendo DS. After playing through the fully upgraded visuals and new 3D perspective of Final Fantasy III, I was eager to see what sort of treatment Chrono Trigger would receive. Would Square-Enix rebuild the game with a 3D engine, or keep the visuals in 2D but re-draw all of the sprites? The soundtrack certainly deserved to be re-mastered, maybe even with a symphonic performance track. My head was buzzing with the thoughts of one of my favorite games being brought back and drastically improved. Then the first screenshots came out and they were… the same as always. It seemed that the only changes being lauded by Square-Enix were the inclusion of anime-style cutscenes (which were already made for the PS1 port, and could be watched anytime on Youtube), an extra dungeon or two, and a Pokemon-esque battle arena. Hoo-freakin-ray. Needless to say, I gave up on buying this seemingly lackluster port and moved on to other major releases in 2008. Nearly five years (and one massive sale) later, I decided to pick up Chrono Trigger DS and complete yet another playthrough of a classic RPG. What I found upon this tiny cartridge was not just another lackluster rom-dump of an old game, but the perfect version of a Super Nintendo classic. Right from the start of the game, there are two new options that take advantage of the design of the DS. The first of these is using the touch screen controls to navigate the game menus and commands. The second gives the option of playing with all of the menus displayed on the lower screen of the handheld, leaving the actual game world on the top screen. This is huge. 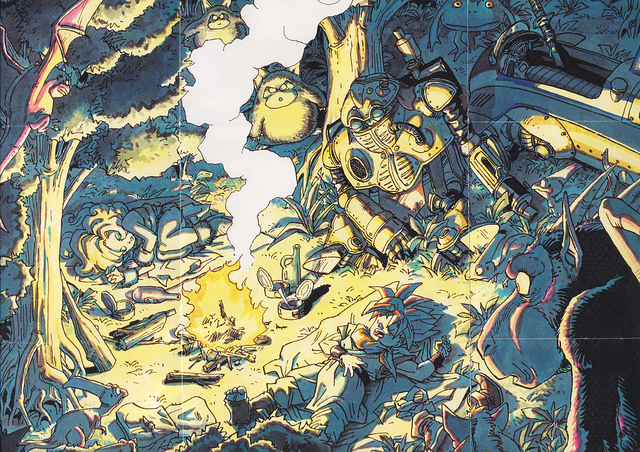 Chrono Trigger is well-known for its distinct art style by Akira Toriyama, and being able to enjoy the game’s visuals without any sort of menu clutter is an excellent upgrade. All of the memorable battles and gorgeous sprite work were presented like never before, and I was able to appreciate the art from a new perspective. The story has been expanded to a degree as well. A fresh translation was completed and included, which provides a more accurate and fleshed-out narrative. This means that all of the “cafes” from the SNES version have been transformed back into taverns and pubs, and any sort of mature content/dialogue has returned, which certainly gives the cast of characters more depth. The cutscenes add a bit of flair to the game, and run quite nicely on the DS. Furthermore, an extra ending was added, which creates stronger ties from the game to its pseudo-sequel, Chrono Cross. All of this is topped off with an in-game encyclopedia which catalogs and details every enemy, boss, item, and ending as the player encounters each one. So far, this post must seem like nothing more than a roaring endorsement of Chrono Trigger DS (guilty as charged), but what I am really trying to get across is that this game serves as a template more publishers should follow when re-releasing older titles. Instead of simply providing players with a fancy emulator to play old games, companies should be piling on special treatment to these classics. Imagine downloading a game from the Virtual Console or PSN Classics and receiving tons of concept art, developer interviews, or even the original instruction manual for a game. Planning to release an HD collection of games from the Playstation 2? Include the original versions, voice actor interviews, bonus games; really the sky’s the limit with this stuff. It may cost a bit more to add these tidbits to a re-release, but the content is certainly worth it and I am ready for video games to receive the same fanfare and treatment as the film industry. Me, too. Certainly something to consider. I’ve been wanting to get Chrono Trigger, so now I’ll have to see if I want this version or the original (I always like the originals, just because they’re…the original). I agree, games should have extra content if they bring them back. I just got the HD version of the first “Kingdom Hearts”, which is actually the Final Mix version previously only released in Japan. I have yet to play it, but I hope there are plenty of new things added.